I have a new snack recipe for you! Protein Packed Energy Bites. These Protein Packed Energy Bites get a lot of their protein from quinoa. Quinoa is one of the only complete plant based proteins. In addition to the quinoa, I have also added some seeds. 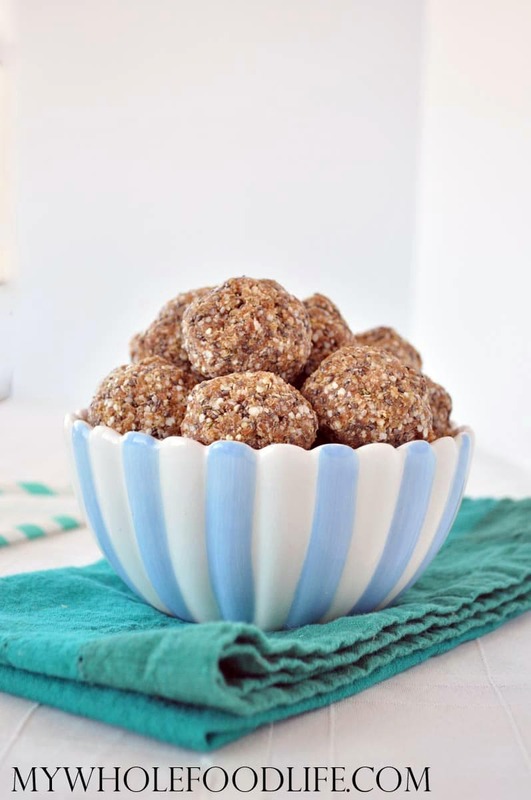 These healthy energy bites are healthy and super easy to make. They would make a great pre or post workout snack. These energy bites are vegan and gluten free. I used quinoa flakes which are similar to quick oats in texture. If you didn’t want to use the quinoa flakes, you can probably use quick oats in their place. Nuts may also be a good sub for those that are grain free. If you like energy bites, you may also like my grain free energy bites or my 3 ingredient energy bites. A healthy pre or post workout snack! In a food processor , combine the quinoa flakes, chia seeds, hemp hearts and cinnamon together. Pulse a few times. Then add the dates and the coconut oil. You will see the mixture start to clump together. If it looks a tad dry, you can add a little water too. Roll into balls. The mixture will feel a little loose, but I promise it firms up in the fridge. Place on a parchment lined plate in the fridge to firm up. It should take about 30 minutes. These look so good - and SUPER healthy! 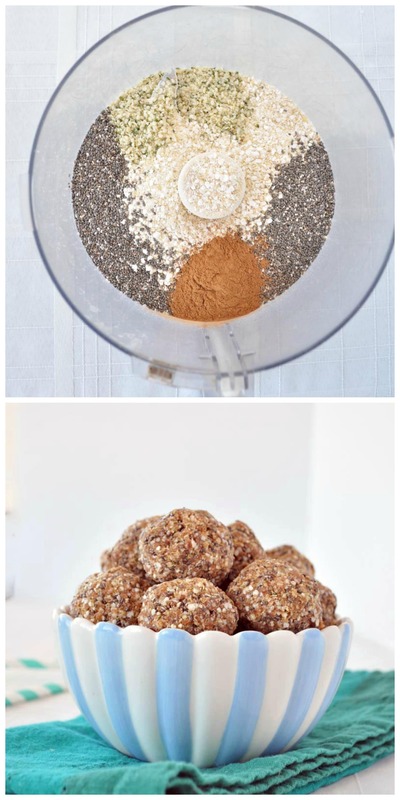 I haven't used quinoa flakes before but I love how simple it is to add them to these balls. Do you think I could make a big batch and freeze some of them? Thanks for a great recipe, Melissa! Thanks Vanessa! I think you could definitely freeze them. Is the coconut oil solid or liquid? Could you sub flax seed for hemp hearts? I would love to make them tonight and I don't usually buy them. Thank you!! Quinoa is a great plant based protein source. You can also use oats instead if you prefer. Do you know what the nutritional values are for this recipe? Also, have you ever used any other seasoning besides just cinnamon? I am likely to trya baking mix with some cinnamon, nutmeg, clove, and such. Again, Thank you for your recipes!!! Below is the nutritional info from My Fitness pal - Nutrition Facts Servings 12.0 Amount Per Serving calories 138 % Daily Value * Total Fat 4 g	6 % Saturated Fat 2 g	10 % Monounsaturated Fat 0 g Polyunsaturated Fat 0 g Trans Fat 0 g Cholesterol 0 mg	0 % Sodium 1 mg	0 % Potassium 151 mg	4 % Total Carbohydrate 25 g	8 % Dietary Fiber 3 g	13 % Sugars 14 g Protein 3 g	5 % Vitamin A	1 % Vitamin C	0 % Calcium	3 % Iron	6 % PS - Not as much protein as I'd expected in one serving. Pingback: Energetski slatki zalogaji prepuni proteina – Odlični prije i poslije vježbanja!